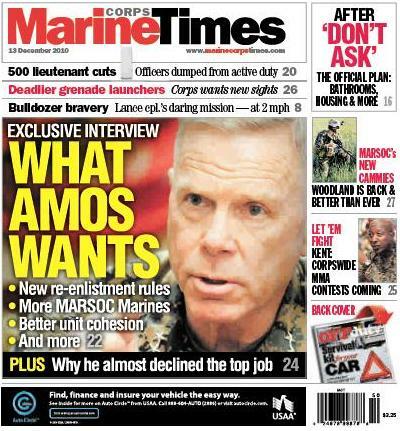 This week’s Marine Corps Times cover story cuts right to the chase: It’s all about what the service’s new top officer has planned. Commandant Gen. Jim Amos sat down with Marine Corps Times senior writer Gina Cavallaro and managing editor Andy deGrandpre last week, outlining a variety of priorities for the service. Among them, he wants to see Marine Corps Forces Special Operations Command continue to grow, new re-enlistment rules and better unit cohesion. He also disclosed his feelings on the Corps’ tattoo policy. If you look at the cover image above, you’ll also see a teaser that says he “almost declined the top job” in the service. That’s true, and the details are inside. I’ll tell you what I want from the CMC. I want the rules on Privately owned firearms changed. We fight for this country and it’s Constitution but we can’t enjoy the same rights as everyone else. If someone had been carrying at Fort Hood all those Solders might not be dead. Gun Free Zones aren’t. They get people killed. Make Military base Gun friendly and we’ll be safer. You are so right….A young lady from our hometown was one of the troops the was there that day. She told me she could and would have ended it much sooner if she had been armed.